indy Craig doesn’t remember much about the view from her hospital room a quarter-century ago. She certainly saw no pastoral landscape. It was inner-city Cleveland. Concrete. Cars. Perhaps small patches of trees or grass like indistinct smudges on a window. An artistic 15-year-old at the time recuperating from surgery for a rare bone cancer in her right knee, she turned to her sketchpad to help fill the unending hours of treatment that eventually led to a full recovery. Around her 40th birthday in 2014, she got devastating news: Her osteogenic sarcoma had returned. This time, Cindy was enjoying a thriving career at the University of Florida as a psychology and sociology librarian, traveling and enjoying life. Once again, she turned to art to help her body and mind navigate the tumultuous road ahead. Cindy did not travel that path alone. Like the thousands of patients who pass through the doors of UF Health’s many medical units every year, each one carrying their hopes and fears, Cindy leaned on teams of skilled caregivers there to help guide her back to good health. One of those heroes is an unassuming artist who brought solace to her world with his periodic visits. He also brought an aging piece of equipment and an idea, one that would grow over the weeks into a project that, in turn, has become an online affirmation of the importance of beauty and art in healing. In fact, the UF Health Shands Cancer Hospital where Cindy received treatment incorporates design elements that recognize how aesthetics aid healing. That’s a philosophy that has also guided the design of the two new hospitals rising along Archer Road, adjacent to the cancer hospital. In the weeks of treatment that followed, Cindy took in intriguing views from the eighth floor of the hospital and found a way to harness the power of a room with a view. This time, Cindy used a borrowed video camera. She pointed it in a direction that served as the title of the project: Out the Damn Window. It’s hard to know what will spark a patient’s enthusiasm when Dylan Klempner visits. It might be painting or sketching or writing a poem. Sometimes, it’s simply ordinary conversation, like friends bumping into each other at the grocery store. He poked his head in Cindy Craig’s room one day while she was undergoing grueling chemotherapy because she looked lonely. An artist-in-residence with UF Health Shands Arts in Medicine, Klempner had an art-supply cart that he rolled through the hospital. She painted as they just talked. They hit it off. The distant views of Paynes Prairie were often a conversation starter for Klempner when he made the rounds. He always thought it was a pretty scene and had toyed with the idea of filming it. One day, he suggested Cindy do a time-lapse video. With Cindy’s background in art — she held master’s degrees in library science and art therapy — and her introspection, he thought it might be a way for her to claim a voice, to bring her experience as a patient into focus. He provided his personal video camera, a Canon GL2, circa 1998. He had filmed a documentary on the American chestnut using it. Cindy wasn’t a camera enthusiast, but to Klempner, she seemed open to art experimentation. She was creative and smart. Like him, she seemed to get that a video camera could do more than record a family vacation. It could be her paint brush. Cindy was in the chemotherapy blahs. Her mother would bring in art supplies, but Cindy didn’t have the energy to use them. She was bored, watching a lot of TV. But she couldn’t bring her mind around to drawing. “It was really hard for me to concentrate or feel motivated to do anything,” Cindy said. Klempner’s camera was the perfect foil, a passive project that would take its time-lapse shots on autopilot. At times, she struggled to set up the camera, crying as she tinkered to get the focus and the white balance right. But she stuck with it. One night, as the camera took its frames like an inexorably beating heart, the line to Cindy’s port came loose and a nurse came into the room to reconnect it. Cindy didn’t realize the encounter, reflected in the window, was captured on her video. As bags of saline flushed the chemotherapy drugs out of her system, she and her mother, Della Craig, would gaze out the window over small talk. Cindy felt like she was in a bubble, a different world. The Land of the Sick, she called it, a line she remembered from a writer whose name escaped her. Craig watched her 4-year-old daughter draw delicate flowers in crayon on the paper bags the girl’s steelworker father used to pack his lunches. When her daughter got sick with cancer as a teenager, Craig brought a sketch pad so the girl could endure the drudgery of being a patient. Craig didn’t think of cancer again even when her daughter’s knee, the site of the previous tumor, began aching again all these years later, terribly so. But the pain was too sharp, the swelling too severe. They worried a surgeon wouldn’t not be able to save the leg from this faster-growing tumor. Craig felt helpless as her daughter cried and wondered aloud if she would be able to endure another recovery. 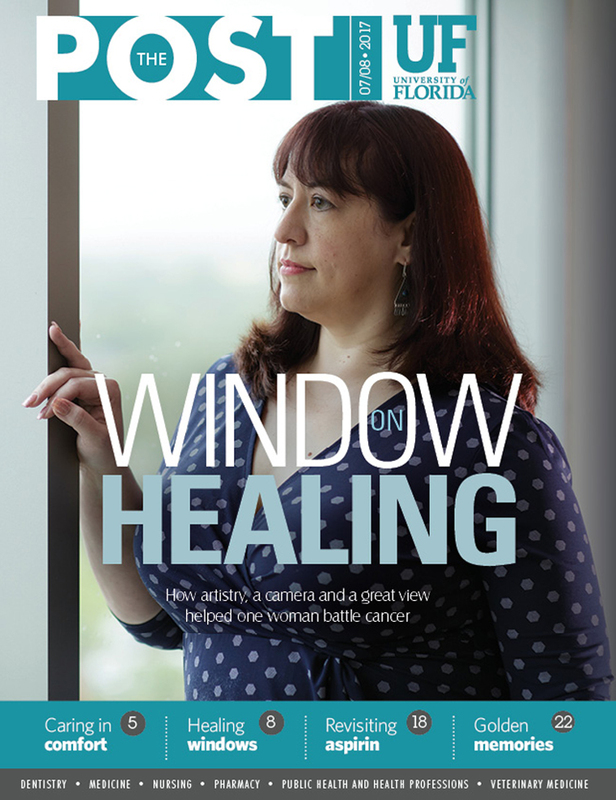 As she sat next to her daughter during rounds of chemotherapy, they shared the boredom and emptiness of hospital life, each lost in her own thoughts as they gazed across the UF campus or the distant Paynes Prairie, depending on which side of the hospital Cindy’s room was located. Craig made home-cooked meals of everything she knew her child had loved since she was a kid. Cabbage and noodles. Meatloaf. Chocolate cake. Craig rolled her eyes and finally interrupted. Not Klempner. It struck him as authentic and true. His enthusiasm for it brought Cindy around. She began to love it, too. But he was unsure “Out the Damn Window” would fly. The video would be seen by a limited audience outside of UF. Was it too edgy? He nervously brought it to a staff meeting and to his boss and colleagues. The boy could watch the trees sway in the wind endlessly. Many years later, he would recall their power to calm him. Sick with kidney disease, Roger Ulrich spent hours looking out his bedroom window. “My window was my compass of stability,” he later said. He became a behavioral scientist studying environmental aesthetics and the effect on health care facilities on medical outcomes. He viewed his work as basic science and had no practical application in mind, according to a 2010 magazine interview. In his research and the work of colleagues, Ulrich saw reduced blood pressure and other physiological indicators for patients viewing nature scenes. He designed a deceptively simple study to explore whether a nicer view affected patient recovery. The germ of the idea came from that boy’s long-ago view. He found a suburban Pennsylvania hospital. On one side of the facility, patient rooms overlooked a stand of trees. On the other side, they saw a brick wall. Ulrich studied the experiences of 46 patients, half with the view of the wall, half with the view of the trees. He found the tree-view group had shorter hospital stays, had slightly lower postsurgical complications and required fewer pain medications. That 1984 study is one of the most-cited in hospital-design literature. Sometimes, you’ve just got to move the toilet to release a breathtaking vista. More on that in a moment. The understanding that aesthetics benefit patients, families and staff has helped revolutionize hospital design. It grew, in part, out of the patient-centered care movement and the Women’s Center concept, which recognized that having a baby was a life experience, not an illness, said Bradley Pollitt, AIA, vice president of facilities, UF Health Shands. Take the UF Health Shands Cancer Hospital. Opened in 2009, it was designed with aesthetics as a focus. A hospital stay can mean a sense of lost control. Pollitt said adding back that control, even in small ways, helps reduce stress. So, the main room light is moved to the patient’s head wall so a nurse walking into the room in the night need only turn on a nightlight or work station light. Patients can manage the air-conditioning and close the window blind and control their reading light from the bed. At the new UF Health Heart & Vascular and Neuromedicine hospitals, opening in December, mock-ups of the rooms were built in a warehouse 18 months ago, leaving nothing to chance. In many hospitals, keeping the patient closer to the nurse meant putting the bathroom out by the window. To provide space for a larger window and more natural light, the bathrooms at the cancer hospital were moved, Pollitt said, with a special alcove for the nurses’ station designed so they could still easily view the patient. “So you’re not stuck in the hospital,” Pollitt said. Similar care went into the design of the new UF Health North Hospital in Jacksonville (see story, page 5). Suites there were built so that each room has numerous windows to fill it with natural light and to help with healing. Cindy and her mother, Della, are back to where they want to be, enjoying life. Bison. Gators. Wild horses. Not bad topics for a conversation starter in a cancer hospital, but that’s what windows do. To oncology nurse Carmen Curry, R.N., O.C.N., they open worlds. Working with chemotherapy patients on 8-East, she sees the patients’ surprise when they see the big, wide windows with the gorgeous views. If the room is on the Paynes Prairie side of the building, Curry said she might talk to them about her experiences hiking there and seeing horses and bison. She might mention the time she saw two bull gators with chests raised like obstinate bullies as they growled at one another. “Patients’ expectation is that they’re going to be led into a sterile, fluorescent, stale environment with an institutional look and feel and smell,” Curry said. What they get is a chance to disconnect from their medical world, to let their mind wander, to spark a relaxing memory or their imagination. Curry saw Cindy setting up the big, old video camera and poked a little fun at her, wondering why she wanted to use such ancient technology. Then Cindy explained, and Curry thought it was a powerful way to record the experience of being sick, isolated, confined. Curry asked Cindy for a CD copy of the finished video. She was surprised at the number of times Cindy was awakened in the night. Curry found the same mix of sadness and joy in the view. And she thought of her growling gators. Cindy is recovered and back at work in Library West. Doctors are closely monitoring her. Cindy now is a believer in the power of the arts to reduce boredom and stress, to allow patients to maintain dignity and a connection to their humanity. The video opened a vista beyond the sterility of her hospital room. “Out the Damn Window” speaks to her of the isolation and tedium of hospital life and of the compassion of caregivers viewed in a window’s reflection and of time slowed and disjointed.